Of all the readings and workshops that In the Company of Jane Doe has had over the years, this – my first NY production – is the first one I haven’t been able to help rehearse. On one hand, it’s kind of exciting because it will be a completely new experience for me to walk into a space and see the play done based solely on someone else’s interpretation of what’s on the page (and a few email clarifications between myself and the producer). On the other hand, it’s kind of terrifying to think that I will walk into a space and see the play done based solely on someone else’s interpretation of what’s on the page (and only a few email clarifications between myself and the producer). It’s been a healthy challenge in learning to respond to notes and questions coming from people meeting the play for the first time as well. I don’t even remember sending the play to CAKE productions two (or was it three now?) years ago. Apparently they had posted a call for female-focus plays and I had sent them Jane Doe. They received so many submissions from that call that they simply read till they found something they liked, produced it, and then went back to the pile of unread scripts for year two. When they called me to ask if they could do a reading of the play, I was surprised (as I confessed, I didn’t remember sending them the script) and I was also over the moon excited. When, after the reading, they said they’d like to produce it, I was over the moon again. But when they asked me if I would take some script notes, I crash-landed at my desk and began to sweat like a mother-f***er. But only a few of those emails had notes – really good notes – notes that challenged me to look at this thing I’d written at the start of my playwriting career and tighten it up with tools from my “7 years later” tool box. So I wrangled the notes – I didn’t turn into a cucumber – and CAKE took the play into rehearsal. They sent me a few more “Can we cut this, Can you write a bit more of that” emails that I listened to and worried over – it was really hard not being in the room and hearing these beats skip in the way they said – but all in all, I had to trust them and trust myself, and negotiate my own view of the play with what they were hammering out in rehearsals in regards to which changes needed to be made and which did not. It was a crazy new experience… and one I hope I managed well. I guess I’ll know when I see the play on Thursday! But all in all, this new step of “playwriting from the opposite coast” brought with it a lot by way of learning to let go, and just trusting in the play – quite a feat for an self-admitted control freak. This week I’m traveling to NY to see my play open off-off Broadway and I’ll be sharing it with all of you – what great blogging synchronicity! 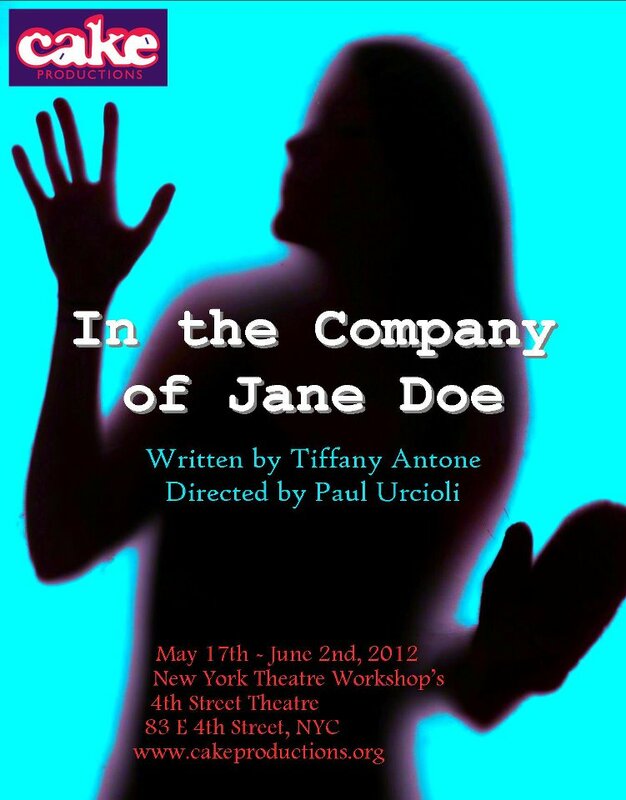 About 7 years ago I began a little play called In the Company of Jane Doe. It was my first graduate school play and only my second full-length play ever. I was in the throws of “How am I ever going to get everything done?”ness and I had a wacky dream about a mad scientist and a woman who clones herself, only the clone comes out looking like she would sans all the plastic surgery and etc. she’d had done to herself over the years. I woke up enthralled – I’d found my play! The writing of the thing was another matter – all too aware of my newbie status as a writer, I allowed my un-baked babe to prance around before my peers for dissection at quite the price: they didn’t get it, and I began to think I didn’t know how to write. I spent the summer after that first year of grad school convinced I’d made a horrible mistake, but I kept working at the play because even if it wasn’t there yet, and even if they didn’t yet get it, I knew where I wanted it to go and I really believed I could get it there if everyone would just stop asking me so many dang questions… See, I’d started to realize that the people who’d been challenging me along the way weren’t to be blamed for all that I hadn’t yet gotten onto the pages – it was time for me to stop worrying about everyone else for a little bit and just write the damn thing! So I did. I took the notes I thought helpful, and I ignored the ones based on the play’s absence of “Finished-ness”. I worked hard to take the play where I knew it needed it go and go there it did! And, as a result, I learned that all that strife and stress I’d been fighting was the result of showing my work too early/allowing too many notes to land on my big-sensitive heart. I learned that I shouldn’t ask for opinions until I have gotten a thing as far as I can on my own, lest I get feedback on something I already know is undercooked. I learned that I don’t need to take every note/comment/or question. I learned to trust my own inner muse. That that summer the play was selected by the Playwrights Center for their New Plays on Campus project and was a finalist for the Princess Grace Awards. Those little victories were just what I needed – I redoubled my efforts and the play has had several other cool awards and opportunities tacked on to it since. It even got a production in LA in 2008. This week In the Company of Jane Doe opens in New York. It’s been a long journey and a lot has happened to me since I met Jane Doe and the wild clone-making Dr. SNAFU – I graduated, I’ve written a number of other plays that have had cool things happen to them, I’ve been unemployed, I’ve taught, I’ve created playwriting opportunities for other female playwrights, and I’ve gotten a little less precious and a whole lot tougher about all of it along the way.